Description: Exquisite styling and luxurious charm are reflected in this decorative wall sconce. 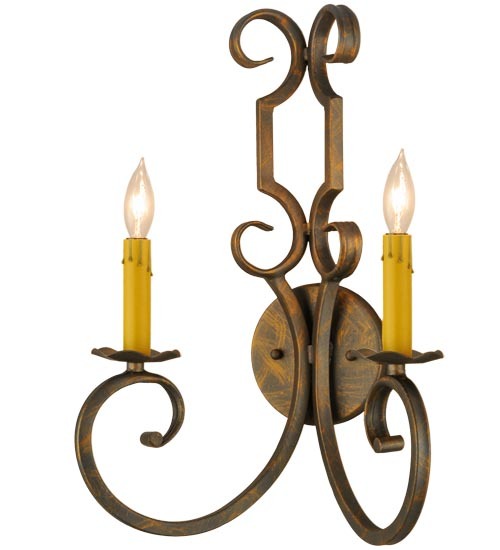 Carlo renders an elegant design adorned with scrollwork and hardware in a French Bronze finish. This sophisticated sconce renders 2 Amber faux candlelights perched on delicate bobeches and designed for beautiful ambient light. Custom sizes, styles and colors are available, as well as dimmable energy efficient lamping options. This 18-inch tall fixture is UL and cUL listed for damp and dry locations.